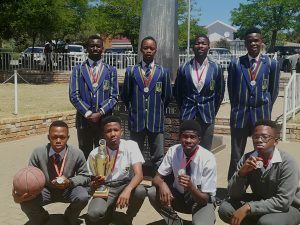 The first team boys basketball players competed in the Sol Plaatjies Municipality Basketball tournament (SPBT) held at the Kumba Skate Plaza, Kimberly on the 15th of September. The won the tournaments and Tshepang Lebeko was awarded, most valuable player of the tournament. The victorious 13 were: Lehlohonolo Motaung, Kathleho Khunou, Lefa Lekhafola, Tokelo Jeloa, Likhaya Nete, Kitso Obotseng, Thoriso Thabethe, Sipho Manya(District Basketball player), Jered Gentles (FS Basketball player), Bonga Radebe, Darlington Ishiwu ( District Basketball player & captain of BHS team) and Tshepang Lebeko. We are very proud of you guys congratulations!